Standbridge College announces the quarterly Favorite Charity Contest where students, faculty and staff are encouraged to submit their favorite charity and why the Stanbridge community should contribute to its mission. This quarter, Stanbridge College would like to support the town of Joplin, Missouri as it recovers from the devastating tornado hits in May. 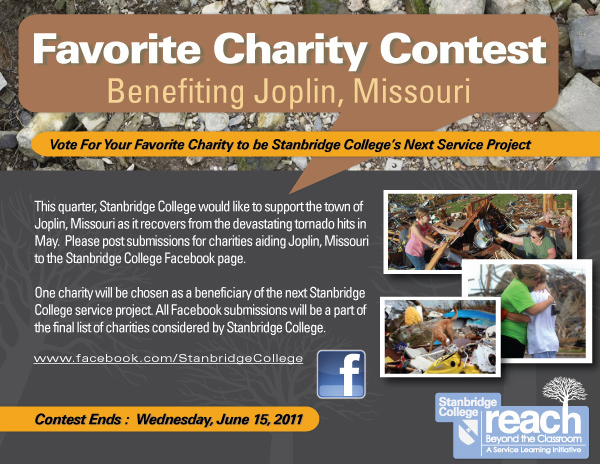 Please post submissions for charities aiding Joplin, Missouri to the Stanbridge College Facebook page. Contest ends Wednesday, June 15, 2011. All Facebook submissions will be a part of the final list of charities considered by Stanbridge College. ShelterBox and the Japan Relief project were chosen as last quarter’s favorite charity. Stanbridge College students, staff and faculty were able to raise over $2600 to help the victims of the Japanese tsunami and earthquake. Stanbridge has also donated time, funds and supplies to a wide variety of organizations including Project HOPE School, American Red Cross Society, Doctors Without Boarders and Habitat for Humanity. The Favorite Charity Contest is part of Stanbridge College’s REACH – Beyond the Classroom Service Learning initiative. The REACH initiative provides students with opportunities to give back to the community while earning credit towards classroom grades in a structured environment. To learn more about REACH, please visit www.stanbridge.edu. For more information and photos from REACH events please visit Stanbridge College on Facebook. Tattling on nursing colleagues: When is it right?